Zuckerman's weekly capitol caffeine klatches offer the lite gov an opportunity to rub elbows with ordinary Vermont citizens, to nod thoughtfully while they grouse about their property tax bills, and to answer questions about everything from health care reform to "Why are there pimientos in this cream cheese?" The event is slated for Friday, April 19, from 8:30 to 10 a.m. Clearly, whoever scheduled this time is unfamiliar with the Standard Stoner Time Conversion Variable (9 a.m. = noon). 1. The 4/19 "Coffee With Constituents" will feature Zuckerman unveiling a cannabis-infused work of art by Milton artist Julie “Fisheye” Duquette. 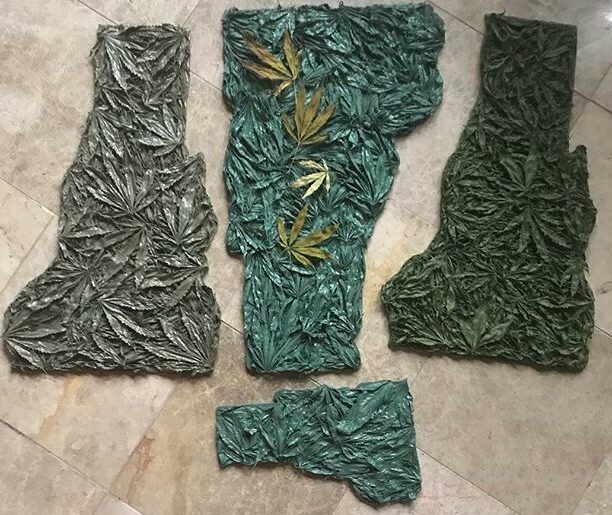 The piece, which Duquette said she created using approximately 300 pot leaves grown and donated by Vermont growers, will hang in the lieutenant governor’s office. What other activities are slated for the morning event? DAN BOLLES: Wake and Bacon, a breakfast smorgasbord featuring hash browns, smoked bacon, green eggs and ham, and pancakes shaped like pot leaves, smothered in CBD-infused maple syrup. JORDAN ADAMS: After the ceremonial hanging of Duquette's piece, local artisan Tokes Gently will unveil shadow boxes full of miniature topiaries in the shape of famous Vermonters, created from buds that came from the same plants Duquette used to make her piece. Expect to see tiny green versions of Ethan Allen, Matthew Lyon, Bernie Sanders and Champ, the Lake Champlain sea monster. KEN PICARD: The Zuckster will break off a chunk of Grand Isle County and vape it in his Pax 2. 2. What special advanced preparations for this event are required by Statehouse staff? SP: Preparations for the 4/20 event went to pot, and it was weirdly scheduled for 4/19. DB: They had to learn all of the words to Phish's "Fee" for the ceremonial morning sing-along. JA: Statehouse staff will spend the morning setting up the post-ceremony sundae bar, replete with 420 different toppings. KP: Buildings and General Services will erect a temporary security barricade around the 3D art portrait of former governor Peter Shumlin deejaying at a Rutland rave. DB: Bernie Lite. Zuckerman's brand inspires many of the same heady ideas as the strain that preceded it, but it's not as harsh as the original. KP: Raucous Caucus, Biennium Blackout, Joint Session, Sunset Provision.